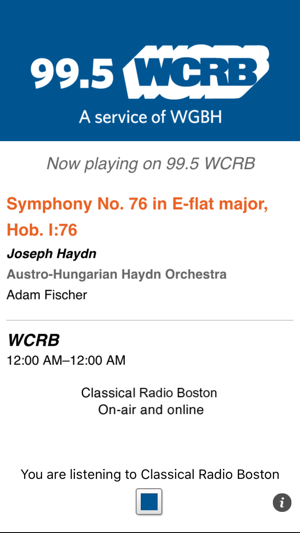 Classical Radio Boston 99.5 WCRB – Timeless music. Live Performances. Boston Symphony Orchestra. World-class artists. Streaming 24 hours a day. A service of WGBH, Boston, Classical Radio Boston is your online and on—the-go source for live and recorded classical music from our studios, Symphony Hall, New England, and around the globe, free of charge, 24 hours a day. 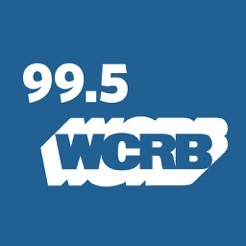 99.5 WCRB now includes a "now playing" area with song info. I use this app even when listening over the air, to help identify the music I am hearing. As a result, I have learned more about some favorites, and have been able to look up more background information on Wikipedia and elsewhere. Unfortunately, the information is delayed or not even presented for some pieces, especially at certain times during the day or night. It is frustrating when the only info is “so-and-so’s overnight classical” or something unhelpful. This may not be a defect in the app as such, but the overall service is dependent on somebody supplying the proper supporting information. The addition of info on what is playing is a welcome enhancement. Unfortunately it does not seem to fix the issue I noted - playing using my iPhone on a 50/50 wi-if connection the app periodically drops the connection and does not reconnect until I go into the app. The only workaround has been and still is to disconnect from wi-go and go with the cellphone LTE connection. Yes, needs playlists. We want to know at least as much as you can get on the web site. But more important it keeps dropping out. We are on a 50/50 FiOS connection but get more reliable service by turning off that and using the cell phone LTE connection. Something is wrong with the way it connects to wifi and recovers from problems it would seem. WCRB is hands-down the best classical music programming you'll find. This app, however, tends to drop out frequently to buffer or sometimes just stops. Rarely get through one musical piece without interruption or stoppages. I've taken to using the webpage instead... which seems to be a more stable stream as well as having access to streams of the station's additional content.